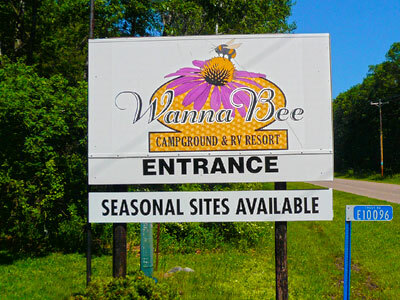 Wanna Bee Campground & RV Resort in Wisconsin Dells is situated on 60 forested acres just 2 miles from the major attractions of Wisconsin Dells. With 125 spacious campsites for tents or RVs with full campground facilities, the Wanna Bee Campground Resort also offers rustic cabin rentals for those who prefer more traditional lodging. The Resort provides some nice outdoor amenities including: a heated swimming pool, game courts, mini golf, bike rentals, playground, snack bar, nature trails and free hot showers. With the thrills and fun of Wisconsin Dells just minutes away, the Wanna Bee Campground & RV Resort gives outdoor lovers an enjoyable woodland base camp. We checked in and drove to our secluded basic campsite. The main problem was that the people who paid for the RV sites run the campground. They yelled at us to be quiet and the management – live in a trailer by the OFFICE told us that other campers were getting upset. Really! It was me and my wife. How LOUD could we have been? I wish I could have gave zero stars for service.